From 1-4 April 2016, The Activist Hive organized an Activist Lab in Mitrovica, Kosovo. The Lab was done in cooperation with Community Building Mitrovica (CBM) and social innovation studio Butterfly works. The Activist Labs focus on a specific social need or issue. In this case, the Lab was focused on Urban Development & Public Engagement. More specifically: the Mitrovica bridge zone as an area that is being developed without public involvement or consent and has been a central point of conflict and discussion. Cultural heritage, public space, urban development and the social fabric of a city are strongly intertwined and citizens are -directly and indirectly- the driving force of the development of their city. However, decisions have been made outside the city affecting this area for many years, and recent changes have not involved consultation with local people. 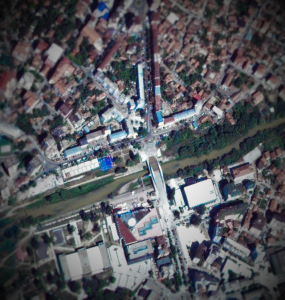 This Activist Lab focused on the development of the bridge zone, including the riverfronts and adjacent commercial and residential areas on both sides of the Ibar / Ibri, and the crucial participation of the Mitrovica citizens in it. It aimed to develop concrete and engaging public campaigns with the aim to create a flourishing bridge zone. During the Activist Lab we followed a co-creation process whereby activists from different backgrounds come together to interact, network, exchange good practices, and develop an innovative and concrete action around a priority issue determined in advance. Activists were supported by an ensemble of experts from outside the traditional peacebuilding field, “unusual suspects” whose involvement guarantees a fresh perspective, new energy, and the novel application of skills. Concepts for concrete actions produced during Activist Lab are elaborated into practical projects implemented with support from PAX country programmes. The Activist Lab is a unique tool designed by PAX to inspire and improve the work of civil society activists, and enable them to connect and collaborate creatively around vital local issues. Learn more about the Activist Lab Mitrovica by checking out some of the visuals and background information on the Lab.